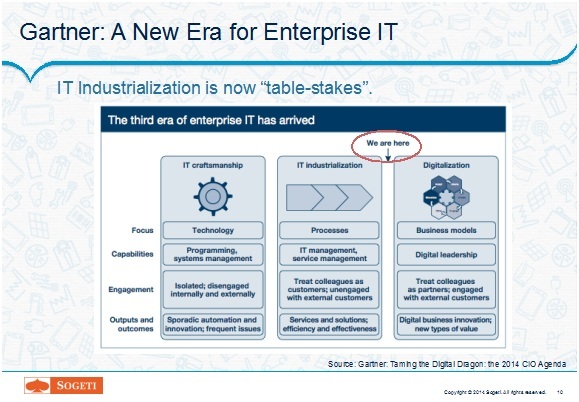 In early 2014, Gartner had stated that in the new digital world, being a good steward of the technologies you already have (i.e. the mature IT service model) is just “table-stakes.” IT’s new role is to proactively drive business innovation supported by new technologies. Taking on this role puts tremendous stress on existing systems and processes, and changes almost everything IT knew how to do in the “old” industrialized era. Aside from requiring a change in attitude and becoming much more business-savvy and innovative in its thinking, IT will now need to deploy new technologies, such as Mobile and Big Data, on top of existing systems. It also needs to be done in rapid fashion, without breaking anything and without adding needless complexity. To do this, IT as a whole needs to become much more Agile than it is today. This new level of Agility is not just reflected in its development processes, but also in underpinning infrastructure, governance, and service management capabilities. Governance Imperative: Become a Service Orchestrator. Rather than controlling and managing all aspects of IT, or managing large one-size-fits-all outsourcing contracts, IT can only stay relevant as a service orchestrator, making sure that various vendor arrangements, outsourced services, cloud-based applications, internal staff and projects all operate in concert. By turning services up or down, on or off, it will be able to adapt much more quickly to changes in the business environment. Service Management Imperative: Establish an Integrated IT Management Platform. IT has lived in the era of pre-ERP way too long, trying to manage its operations with a myriad of disconnected tools. IT cannot survive in the same way how a business cannot sustain itself without integrated platforms for its core functions. IT needs to get serious about industrialization by settling on an integrated IT management platform, with a CMDB at the core, to perform in the digital era. Infrastructure & Applications Imperative: Leverage the Cloud. By now, this is pretty much common knowledge. New HW purchases will become fewer, datacenters smaller, data center operations more scarce as applications, storage, and compute power move to the Cloud and are ready to be turned on and off when required for great gains in speed and agility. Service orchestration (see above) will be key to managing all this and achieving the cost benefits. Architecture Imperative: Establish a Layered Enterprise Architecture. As has been said: “There is no technical problem in IT architecture that cannot be solved by adding a layer or abstraction, except having too many layers of abstraction.” Abstraction layers are essential to be able to rapidly build mobile applications and other new technologies on top of existing systems without creating a maintenance headache. Development Imperative: Manage Throughput (not projects). Most modern applications are not delivered in big-bang multi-year programs anymore. It is important to deliver quickly and frequently, in a highly productive manner. Agile and Kanban delivery processes will be the norm with much higher levels of predictability for productivity and throughput. We see many of our clients embark on initiatives in one or two, or perhaps three of these areas. And, to be sure, to implement each of these is a journey and program in and of itself. 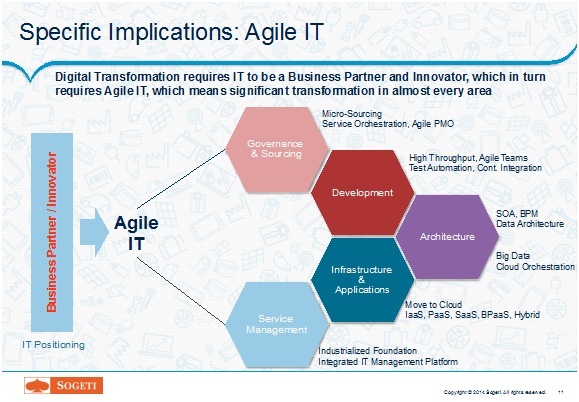 However, what we see too little of is an integrated effort to create Agile IT, coordinating initiatives and making sure the goals of each of these initiatives together lead to the ultimate goal of being able to drive the digital transformation in the enterprise.